I have a few students who are working on idioms and my older students do not need to look at images to go with the idioms all the time. They would much rather learn the idiom and move on to the next one. When I read a review of the Phrase Stress application on another SLP site, I knew I had to have it, especially when I realized there was more than one way to practice idioms on the app! Continue reading to hear more about this application's features as well as for a giveaway of this application! The Main Page of the application has an adorable, yet panicking, rabbit in the corner. There are five buttons at the top of the application and four at the bottom. Shows you how to use the application with visual descriptions. Discusses the population of people who would benefit from using the application. There are 350 idioms on this application. The dictionary states the idiom, its meaning, and a sentence using the idiom. Shows other applications by Artel Larsen. Shows the top scores of children, with their initials, who have played the application. Harder choices on the settings award the user with more points. 1. You can choose the size of the idiom list to be played between 100 and 300 words. 3. Choose the time stress level based on the mood of the smiley face. Once you have selected the appropriate settings, press the "Go" button. You will then see a timer with a green bar that gets smaller as time runs out, a green microphone to turn on/off sound, a question/statement, and three answers. Choose the answer that most accurately fits the statement/question. This will give the user points. As the time runs out or incorrect answers are chosen, the points go down. Once the user has completed application play, he or she will see his or her score. There are three different ways to work on idioms which allows for you to choose the practice style appropriate for the student. There are multiple settings to choose between to choose the appropriate level of difficulty for the student. Idioms are defined as well as put in a sentence which is great for teaching idioms. There are 350 idioms, which is absolutely amazing! I would love for a search function on the Idiom Browser because it is hard to navigate through when there are 350. Either being able to scroll through alphabetically or search for an idiom related to a word would be great. Having an option to view an image to go along with an idiom may be nice for younger students. Idioms - Teach students about various idioms who have difficulty understanding idioms/figurative language. Draw pictures of the different idioms. Discuss idioms of different cultures. Pragmatics - Discuss how people sometimes say things do not always match the meaning. Receptive Language - Teach students idioms and discuss the difference between the idiom and what the words mean literally. Discuss the wording/words used in the idiom phrase and why they may have been chosen. Expressive Language - Have students create sentences/stories using an idiom from the application. Articulation/Fluency/Voice - Have students read the idioms/sentences aloud using age appropriate speech sounds, fluency strategies, and vocal strategies. 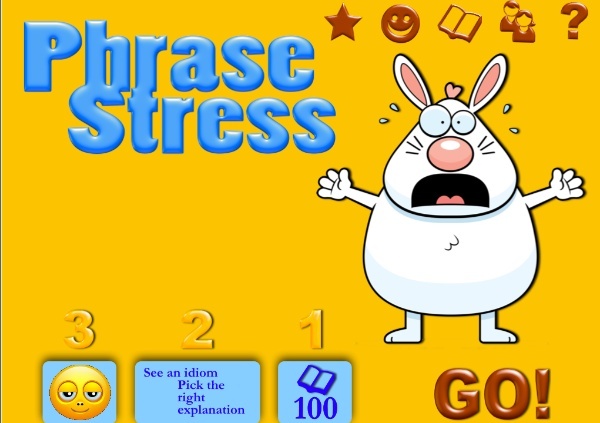 Phrase Stress is available for the iPad only for $0.99! 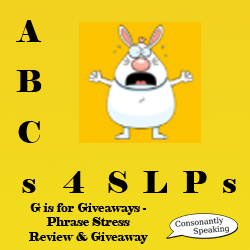 Enter the giveaway for Phrase Stress below!